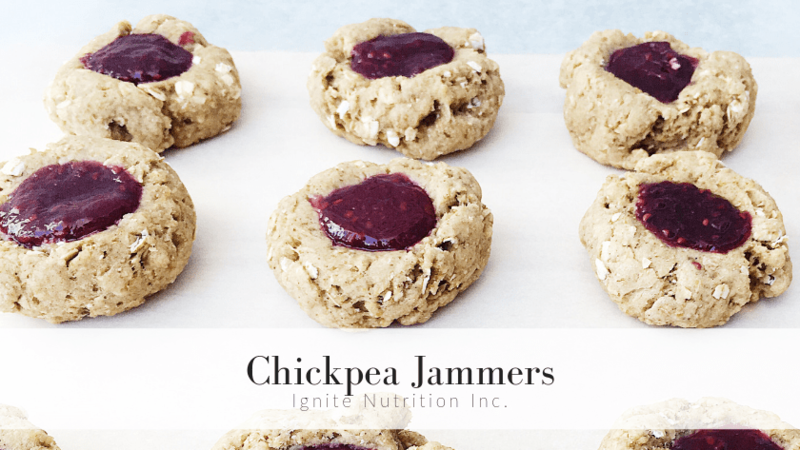 Chickpea Jammers | Ignite Nutrition Inc. Typically, when you think of beans, or lentils you think of savoury salads, or chilli. Adding them to cookies or brownies might not be the first thing you think of, but they work great in these desserts for a couple of reasons! Pulses, are the dry edible seeds of certain legume plants. Pulses includes chickpeas, lentils, dried peas or dried beans. Although they may seem like the inferior choice to add into a baked good, pulses actually contain some pretty amazing components that will boost the nutritional quality of baked goods! Pulses are a low-fat food and great sources of protein and fiber. Pulses contain a lot of protein, which makes them a great plant-based alternative to animal products. One cup of chickpeas contains 18 grams of protein, which is the same amount of protein as 2.5 oz of chicken. In addition, pulses are a great source of fiber. Fiber helps to keep you full longer and also helps keep you regular….AKA regular bowel movements! By adding some pulses to baked goods we can increase the nutritional value of sweets without compromising the taste. 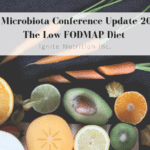 All this fibre, PLUS phytochemicals found in the chickpeas are GREAT for your gut microbiota. So these cookies help to keep your gut healthy! In addition to their health benefits, pulses are a great way to keep the cost of your grocery bill low. Meat sources of protein can get costly. Depending on what you buy, two pork chops could be $7, or two chicken breasts could be up to $12. However, a can of chickpeas costs around $1.50 (or even less at superstore on sale! ), and depending on what you are using them for they could easily serve two people. I love incorporating pulses into some of my weekly dishes as an alternative to animal proteins, and my wallet always thanks me! Ok, I know what you are thinking…pulses sound great Nancy, but in a dessert? Pulses are more versatile than we give them credit for! 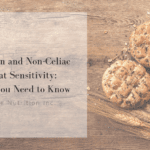 There are so many different ways that we can use pulses for baked goods including serving as ingredients for cinnamon scones, black bean brownies, cookies, or granola bars. Alberta Pulse Growers is an fantastic website that can help support your journey into discovering pulses. They have tips and tricks on how to use pulses, as well as a list of recipe ideas, including the recipe I want to share with you today: Chickpea Jammers! 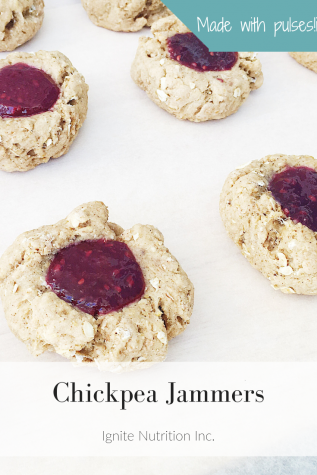 I loved this Chickpea Jammers recipe because it reminded me of the classic thumbprint sugar cookies I had as a kid, but with nutritious twist! These cookies are a great way to start incorporating pulses into baked goods because the chickpeas blend so well into the crust. If you are worried that your family or friends won’t like these cookies, rest assured, I did the taste test on my roommates and they had no idea there were chickpeas in them! Chickpea Jammers are made with a brown sugar, oats and chickpea base and just like the classic, served with a dollop of your favourite jam! Preheat oven to 350 °F and line a baking sheet with parchment paper. In a food processor, blend chickpeas until smooth and no large chunks remain. In a large bowl, mix chickpeas, brown sugar, butter, egg, and vanilla extract. In a medium bowl, mix whole-wheat flour, rolled oats, salt, baking soda, and cinnamon. Mixing throughout, slowly add dry ingredients to wet ingredients until completely mixed. On the lined baking sheet, assemble small balls about the size of a golf ball. Use the back of a spoon to lightly press down the centre until there is a small well. Back for 10-12 minutes, until the bottom is light brown. Once baked, remove and lightly re-press the centre of each cookie to reinforce the small well. Add a small scoop of jam to each cookie well, and enjoy. Note: Canned goods can often have a lot of added salt. When buying canned chickpeas, pick the cans that are labelled “no salt added” to reduce your sodium intake!